PG&E plans to start testing home energy gadgets and software starting in March 2012 with a small group of customers, according to plans the utility unveiled details of this week. PG&E plans to work with its smart grid network provider, Silver Spring Networks, for the software part of its home energy trial. 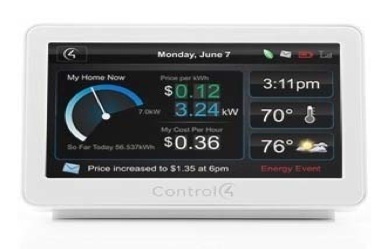 For the initial phase of the hardware trial, the utility will offer Control4’s energy dashboards (see photo). These home energy devices and software will connect to the millions of smart meters PG&E is installing at homes in its network territory. This month, PG&E also created a proposal to offer customers a way to pay a fee to opt-out of a wireless smart meter if they don’t want a wireless smart meter for whatever reason. More quietly, PG&E has been working with Opower to offer a section of its customers detailed bills looking at customer energy consumption and offering suggestions for curbing that consumption. Small home energy gadget trial. Only 500 customers will be trialling the home energy gadgets starting in March of next year. If all goes well, PG&E says it plans to expand that trial to 5,000 customers in late 2012/early 2013, and potentially in a few years, offer these goods to all customers. Initial home energy winners. PG&E chose to start off deploying 500 of Control4’s EC-100 In-Home Display device, which is a pretty big win for Control4. It’s not surprising that PG&E is using Silver Spring’s software for the home energy trials, as Silver Spring also has PG&E’s smart meter networking deal. Silver Spring and Control4 also announced a partnership to work together earlier this year. Separately, Opower has been working with PG&E to use its software to offer energy efficiency services to customers. Other home energy device and software options. Down the road, PG&E says it will offer other compatible home energy devices and services via its network (and on the PG&E website) beyond Control4 and Silver Spring’s software. That will give customers the opportunity to buy or request the products they like and could give entrepreneurs and startups, like Nest Labs, a way into PG&E’s customers base. Standards delay. PG&E says a delay in standards of the wireless networking protocol Zigbee Smart Energy Profile (SEP) 2.0 has caused a significant delay in PG&E’s home energy project plan. The 2.0 standard — the next-generation of Zigbee — was delayed in April 2011 over technical disagreements. Taking a long time. 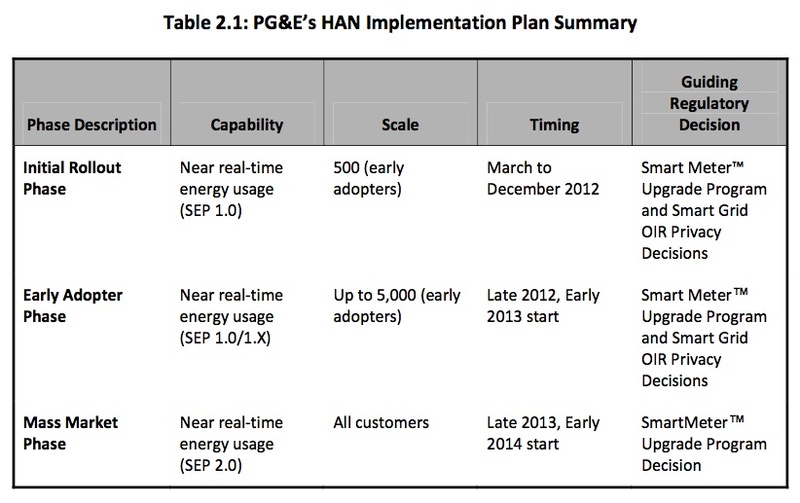 Beyond the standards delay, if all goes well this home energy tech won’t be available to all of PG&E customers until 2014/2015 — yes potentially three or four years away. Communities across the U.S. with smart meters installed have not moved customers to conservation as promised by smart meter/grid promoters. Contests with rewards for energy reduction within pilot programs for smart meters (with or without HAN networks) have reduced energy usage for those customers active in the contest. But upon further investigation, the energy reduction is no greater with the smart meters/HAN than it is in a similar contests with prizes without the smart meters/Han.